Brooklyn's Nikita? Some Brooklyn GOP insiders liken Eaton's tactics to those of the Soviets. Those words, spoken by one-time erratic Soviet Premier Khrushchev, could have easily been spoken by GOP Chairman Craig Eaton, whose recent attempt to muzzle the reform-minded Brooklyn Young Republicans is already being compared by some insiders to the Russian leader himself. Indeed, some insiders are already calling Eaton’s would-be replacement of the YR’s a Brooklyn Young Apparatchik Club. But these tactics are not new for Brooklyn’s own 21st century Nikita. Recently, my colleague Dagny referred to Mr. Eaton as Macbeth, which was both perceptive and accurate in many ways. But to capture Eaton’s methods of purging dissent and debate, one can only turn to the history of the CCCP (not the Catholic Citizens Commitee PAC, the Soviet Union) for guidance. His fear and paranoia over differences of opinion in his own party and potential challenges from those that are probably more qualified than he is or are capable of outfoxing him have made him extremely insecure. He is terrified of being viewed as weak, which is why he and his minions have been falsely boasting that they performed well in the past elections, when indeed every election saw the Republican lose in Brooklyn (including Grimm and Malliotakis, who won on the Staten Island sides of their districts). Sounds just like what authoritarian regimes do: distort the facts. And those methods remain unchanged. Eaton has permitted his sanctioned hate blogs (which he refuses to denounce outright) to rip into anyone who is even remotely in disagreement with him, including individuals that are guilty of nothing but freely associating with those Eaton dislikes, such as Mr. Judge or Arnaldo Ferraro, a former candidate for Chairman of the Brooklyn GOP (despite the fact that Mr. Ferraro attempted to make peace with Eaton more than once in the past). All in an attempt to bully and intimidate people. And all of this is emblematic of Brooklyn’s Nikita, who crushes, destroys and bangs his shoe on the table of Republicanism. 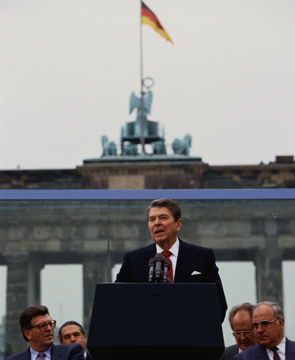 GOP reformers can learn a genuine lesson from Reagan. We just passed what would have been the 100th birthday of Ronald Reagan, a man who confronted aggression and emulated peace through strength as a means of conquering totalitarian political regimes. Like Reagan, the reformers of the party must look to their values and principles combat the status quo Communism one faces in the ranks of the Brooklyn GOP’s petty cabal. But just remember: Eaton is more like Nikita than Gorbachev. I am originally from Brooklyn but now live and work in DC. Please do not attempt to figure out who I am because it is not only impossible but useless. I do not know any of the players involved in this party fight well but you guys on Atlas really need to stop bashing Republicans and then claim to be Republican reformers. I have searched tirelessly for a single win or sign of momentum coming from your side and can not. Please show us where you have made any significant gains. You point to “GOP insiders” and can never name them. Those are not insiders- those are either cowards or people outside (which means on your side). As a Conservative I sincerely hope that Atlas tones it down a bit and stops trying to incite fights with and between everyone. You would be surprised who reads these blogs and their reactions. You guys are actually driving more people to the “establishment” than you even know. I don’t think anyone would be surprised by who reads these blog posts. The blog wars and a series of dire failures and corrosive in fighting on the part of Chairman Eaton has demonstrated that he is not control of his party or himself. He is playing with the limited power he has. My friend, it is the ESTABLISHMENT that has been bashing Republicans left and right. It was Eaton who ripped open the scabs of the 49th Assembly District and who was threatened of the Brooklyn Young Republican Club from the start. You really need to get to know these issues more before you write something like you just did. Because the comparison of Eaton to a soviet leader is actually quite apt. “establishment” than you even know.” Has “Washington DC Conservative” read TJIUA? Wouldn’t that truly hateful blog, which is covered by “Official” GOP icons and links, and the names of the Brooklyn GOP Chairman and his top lieutennats, be driving away equal or greater numbers of “more people…than [we] even know”? We crave a response…..please, leave us not unfulfilled. now, we can call him Nikita. Craig has never run for a single race in his life. He has no conception of what “pounding pavement” means, as the Daily News reported today. The Jig is putting up more anti-Arab hatred. Eaton must have spent some of that Bloomberg money on purchasing white hoods for Gallo, Gene and the whole gang. Eaton’s failure to denounce this only establishes more firmly his establishment’s blatant antisemitism. When the Daily News says there’s chaos in the Republican Party in Brooklyn, it’s not a good day for the Chairman. He has lost control of the party. He seriously needs to consider resigning and letting the party get past this uprising of his doing. What an excellent comparison, and now that civil war has finally broken out, the GOP can clean house as the reformers dominate the message and kick tyrants like Eaton off their thrones. The wall will come down. The confederate young Republicans will lose. Eaton is forever disgraced. The party will be better for all of this. Thank God this day has come. Chairman Nikita Kruschev ordered the Soviet T-34s into Budapest in 1956 to put down the “Hungarian Freedom Fighters”. Fifty-five years later, Chairman Craig Eaton has ordered his “Soviet T-34 bannered Regime Changers” into some clubs and districts put down the “Brooklyn Freedom Fighters”. Hold on to your hats folks The Merlin of Malice was actually quoted in a real news article! Who are you consulting for now Gerry? Will anyone hire you? We all know who your master is,that RINO Marty. He’s only one who will hire you and front your pay by washing dirty money through the Brooklyn GOP. Tainted goods like you don’t sell well. Gerry, you are a dried up fart bag who lives on Metamucil and Milk of Magnesia. You have accomplished nothing and leave no legacy. They didn’t even consult with you in forming their Brooklyn GOP Democratic YR club. Your Aricept stopped working a long time ago. You are a sad delusional excuse for a human being. Thank the stars above your insipid seed with its defective gene pool will cease to exist when you do. Small miracles do happen. Mr. Eaton’s attempt to create a faux-club on the basis of unity is inherently contradictory. In no fashion does propping up a puppet club extend a hand to reformers as an effort to unify the party. If anything, he has furthered the divide in a childish manner. The only Republican Party left in Brooklyn is the Young Republicans led by Jonathan judge making efforts both on the ground and over the web to change the status quo of the current political climate. These Marxist maneuvers by Mr. Eaton are nothing short of an ego trip gone awry. I hope they have fun at CPAC while the real Brooklyn Young Republicans pound pavement at home in Brooklyn. GOPers will accomplish at C-PAC. Eaton, in response to Georgea being so upset about the executive director position going to karen attempted to get bloomberg to hire her- and failed. He probably spoke to an intern, but either way his impotency and internal strife in the brooklyn GOP continues..
website, too, is far superior to any blog or party site I’ve seen. heard of in my life. And that’s it. That’s all they have. This move Eaton’s making is just going to rip the party apart. He thinks it’s going to purge the GOP of dissenters. But instead, it’s going to run the party into the ground. The current establishment has nothing new to offer. Let’s be honest. The ideas are coming from the new young people. It was Judge and his lot who pioneered online outreach in Brooklyn for Republicans. Morons #s 1 & 2 engendered GOP radio long after the Young Republicans did online meetings and featured videos on their website. Their website, too, is far superior to any blog or party site I’ve seen. It’s bright, bold and uplifting. The GOP has mediocre outreach methods, and at this point people don’t want to be bothered with their cheap looking mailings and empty sloganeering. The way to see this is that the GOP is eating their young. Let’s face it. Russell Gall looks to be pushing 40. Peter Ciprian comes off as a know it all from listening to him, plus he’s so fiscally irresponsible. Atlas is right. He wasted thousands of dollars on his campaign. I looked at his disclosures. Waste waste waste. Brian Doherty I’ve never heard of in my life. And that’s it. That’s all they have. So all in all, it looks like an objectively petty move to cut off your party’s right arm by alienating these talented young men and women. If this succeeds, Craig Eaton will be remembered as the Chairman who single-handedly killed the Republican Party in Brooklyn. How does the Kings County Republican Committee sponsor the two morons? Do they pay their hosts… I mean morons? First: “AAA” seems to be making a point of agreeing with “AAA”. Second: Earth to “AAA”… there is no self-destruction of Jonathan J. Judge. Everyone of Kings County Chairman Craig Eaton’s attempted knocks at Mr. Judge have failed to score any knockouts or even significant knockdowns [the 44th CD Race in early 2011 was a “slip”]. All of the failed attempts to bring the Jonathan Judge insurgency to heel have added to the young insurgent’s standing as the “Other Kings County Republican Leader”. Look at all that has been written here, on various other blogs and in several press accounts just about Brooklyn GOP Chairman Craig Eaton’s Two-YR gambit. Then look at how much has been written here about Jonathan Judge, President of the real fully chartered Brooklyn Young Republicans and the “Other Kings County Republican Leader” by the various bloggers and commentators who back Craig Eaton. There were virtually no new Republican recruits “young”, “old” or “otherwise” at the Brooklyn GOP Victory Center on February 15, 2011. There were next to no young adults who were new to the Brooklyn GOP or its candidates. Eaton’s principal justification for re-launching Brooklyn YRs under Gallo was to get new young Republicans who would become active in future campaigns. If February 15th is the measure, few if any will ever appear. 1. Judge/Roy lied if they said it was only 40 people. At one point, I counted 52 people in the room. Then there were a few who came later or already left (this includes Gerry and Anita O’Brien, who were not part of my count). I don’t know who are the children, but this number excludes anyone who was not at least in their late teens. I didn’t see any children. If there were, that’s in addition to 55+ teens and adults who were there. 2. The Orthodox people were not children. All were college-age or older. None were out of place other than your anti-Orthodox (and Roy’s anti-Israel) bias. 3. There were many people who were absolutely new. Joan Braunstein came because she brought 3 young people. I came with a person who was completely new to the party. Also, on the radio show after the party I heard a brand new person whose name I forget. 4. Also notice how many people you listed (Russ, Gene, Eugene, David, Ken, Mike Tracy, Rosenberg, Peter, Karen, Ikra, Alec). You actually left out at least 3 regulars that you should be aware of from their time on Brooklyn GOP radio, plus a 4th person known as “crack staff” who wishes to remain anonymous. That’s 14 young professionals who are party “regulars”. That’s more “regulars” than Judge was able to get in four years. 5. And let me ask you this. When was the last time a Judge meeting was able to get over 50 people? And that’s after 4 years of recruitment by an allegedly uber-competent YR President with the support of the only good GOP club in Brooklyn. For the Russell YRs, this was the first meeting. You can bet your bottom dollar that Russell YRs will not have as few people as Jonathan has right now. In fact, he already has more people than Jonathan YRs ever did. 6. Your attacks on the attendees again display what you are trying to achieve: smear anyone who’s on speaking terms with Craig. Peter is a “master of the obscure factoid”… is that really the best you could do? That’s a compliment! If that’s his biggest flaw, the kid’s alright! “Mike Tracy, recovered retread from the Allegretti Campaign” … seriously? So instead of fairly describing him as a former employee in a congressional campaign – whether you like the candidate or not – this is how you describe him? Like I said, your goal is not reform, it is to smear the Republican party in hopes that people will stop moving from Jonathan to Craig, and ultimately your goal is to destroy the party so that Jonathan could become chairman of its ruins. That’s 14 young professionals who are party “regulars”. I miscalculated. That’s 15 young professionals. Ikra: Who? Oh, friend of hack. All of the real YRs are neither hacks (hired by the party or patronage job holders) nor are they beholden to Craig Eaton. Excuse me, “1” but I made no such comments. Do not post my name as saying something without my concent or citation. I have yet to release a statement an until then you have no right to claim I said something I didn’t. “Big Distinction” – calling someone a “hack” or a “friend” or a “loyalist” or even a “failed candidate” does not detract from their being young professionals or 15 in number. Being a friend or a former candidate does not make you only 3/5 of a person. You still count the same. Do a better job trying to discount people. Everyone except Karen is there voluntarily and Craig has no hold over any of them. Karen is paid now, but she was a “Craig sycophant” (anyone who support Craig is a sycophant, right?) long before he paid her one cent. Roy, I am sorry if I was wrong. I saw you and Judge at the YR meeting so I figured it must be you or him who made the 40-person estimate. If not, my apologies. My two cents: Being a hack, friend of a hack or a loyalist of the establishment does indeed detract from any hope that this so-called “Bootleg Young Republicans” has of being legitimized in the eyes of fellow Republicans. It means that the club is less about promoting Republican ideas as they are in instilling fealty to Eaton among the ranks of the party. This is upsetting because it so clearly models the style of Communist and fascistic tactics employed to engender “loyal youth” answerable only to the party leader. Who is in charge is less about what Young Republicans want than what Craig Eaton wants. That’s a serious problem and is contrary to Republicanism. For example, who chose Mr. Gallo as President of this supposed club? How was he “elected”? Was he “appointed”? I think the fact that the answers to these questions are not readily apparent demonstrates that this club is less about “what young Republicans want” than “what Craig wants.” That appears to be another “big distinction” between this Eaton-endorsed club and the original, authentic Young Republican Club. We all know Gallo was appointed. key disinformation and propaganda tools of Eaton’s GOP. February 22, 2011). Without letting the cat out of the bag, Mr.
in Eaton’s Soviet-styled Brooklyn GOP, and he obviously views Mr.